Who knew Halloween bats could be so cute? Enjoy a fun coloring page with your child, and get ready to celebrate the most ghostly and ghoulish night of the year! 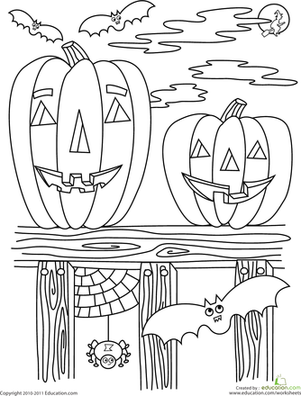 Give this Halloween coloring page to your child and she's sure to be in the Halloween mood by the time she's finished coloring. Have a happy Halloween! 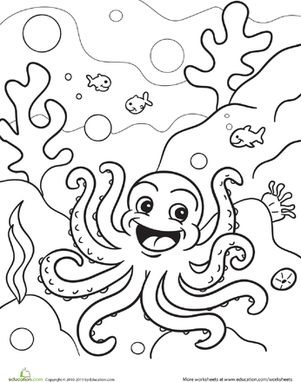 This coloring page is full of happy pumpkins, but they need some colour. Can your child help? Make your child's day this Halloween with a coloring page featuring a spooky hairy spider dangling from her web. Preschoolers will enjoy adding colour to this eerie Halloween scene set in a graveyard featuring a jack-o-lantern, flying witch, and gravestones. This Halloween cat coloring page featuring a black cat and witch's cauldron will surely put you in the spooky spirit! Welcome the arrival of Halloween with this fun coloring page featuring three adorable trick or treaters all decked out in their costumes! 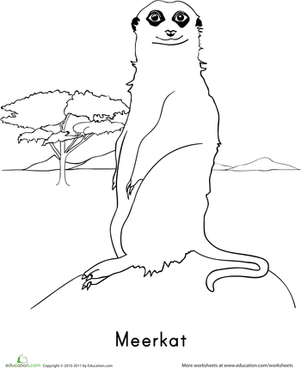 Get into spirit of Halloween by coloring this good-natured vampire bat.